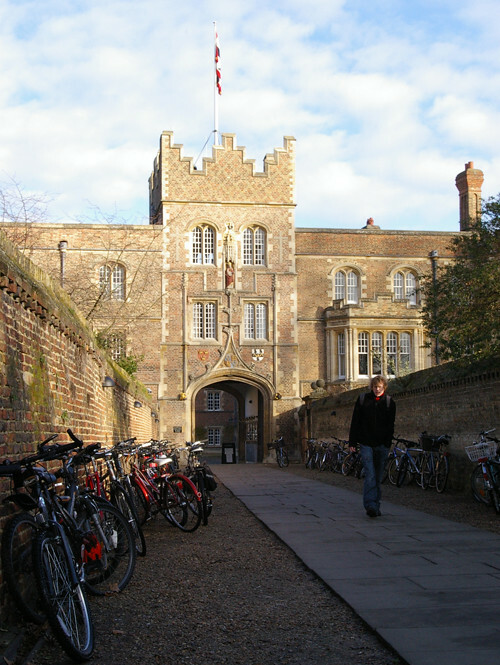 This is the second time that we have been invited to submit proposals for a limited competition for Jesus College, Cambridge, being finalists in the 1998 competition for student accommodation. 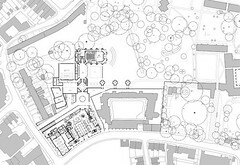 This competition between ourselves, two London practices of Burrell Foley Fischer and Hayworth Tompkins and the Spanish architect, Rafael Moneo, was for a larger and much more complex brief at the opposite end of the College, partially on the site of a former garage.. 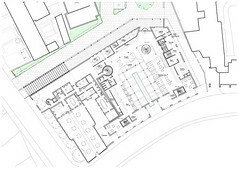 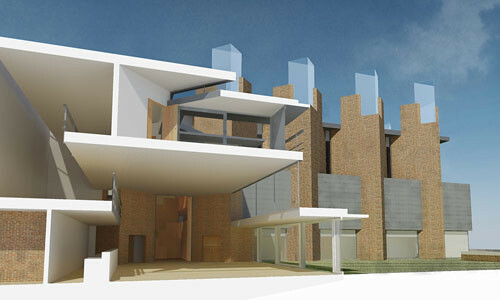 The project brief consists of, in the first phase, a music auditorium for 250 audience, foyer, practice rooms etc and a 70 bed boutique hotel, the latter being an independent facility on Jesus Lane with the architects asked to investigate the possibility of either a completely new structure or a building behind a façade retention of derelict existing properties. 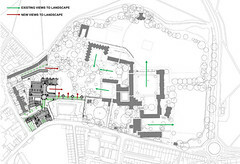 The music auditorium should be linked to the hotel for conference purposes and although primarily a College facility, it should be accessible to the public without them having full access to the College. 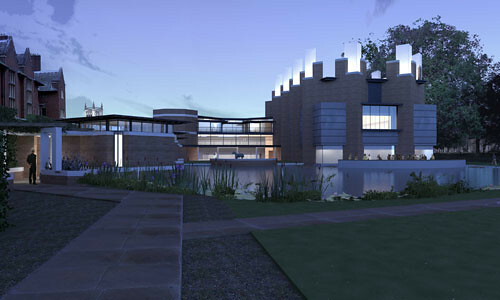 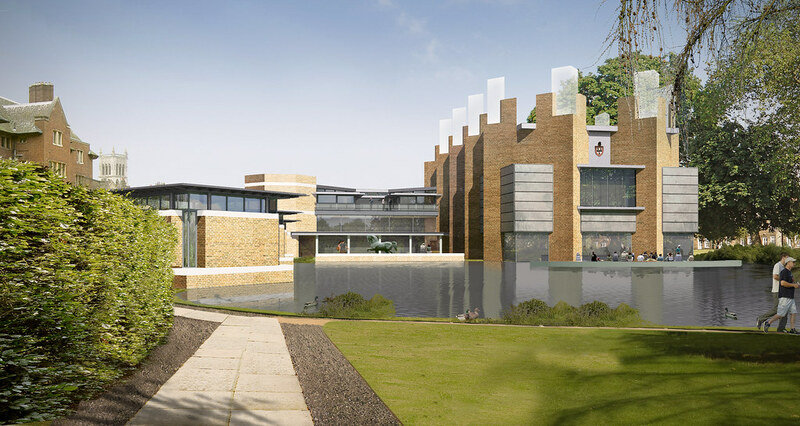 A second phase comprising sports centre, capable of conversion to a studio theatre, (with similar dual access arrangements) and a small research institute was proposed. 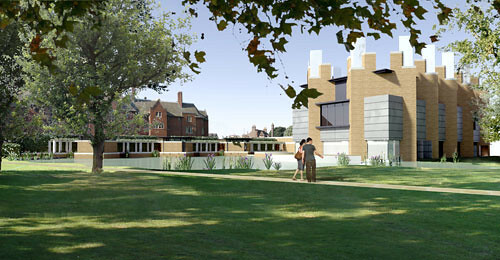 We are delighted that the college has selected our practice to develop towards a planning application. 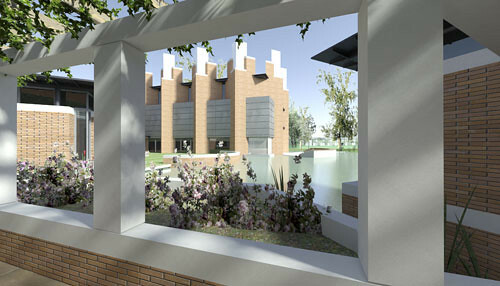 The drawings illustrated are in advance of a planning submission and represent our thinking after the benefit of interaction with the College. The Auditorium and foyer shows an L-shaped building expanded by a loggia to form a three-sided court addressing existing landscape , a common pattern found at the College over the last five hundred years. 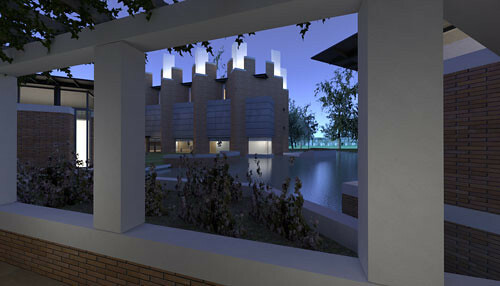 The auditorium itself has a number of galleries and externally is marked by brick chimneys topped with etched glass lanterns. 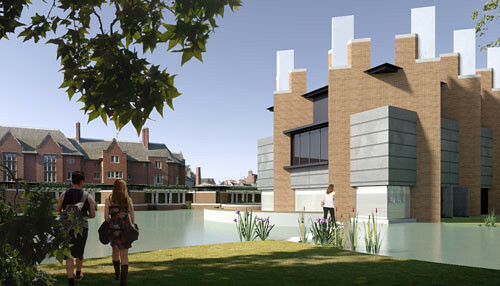 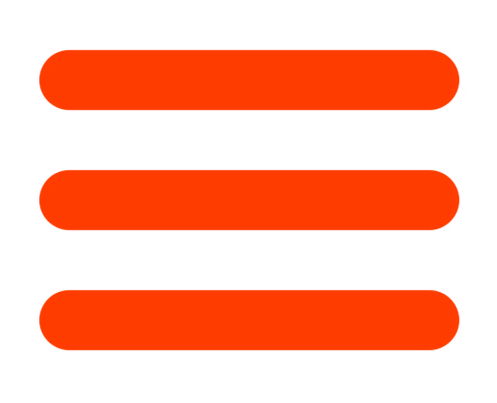 These help ventilate the building and obviate the requirement for artificially chilled air. 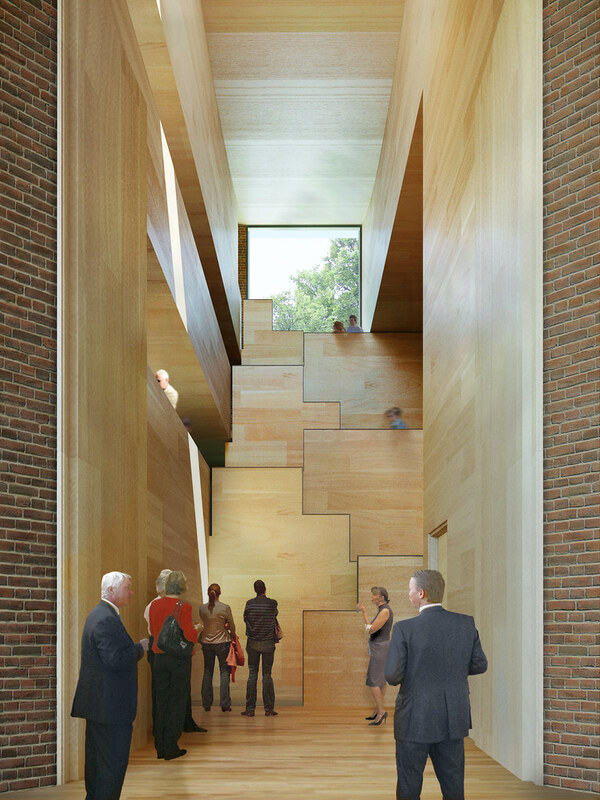 The foyer is a room in its own right and has an upper exhibition gallery with seminar rooms on the top floor. 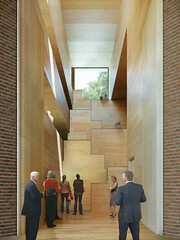 The whole foyer opens to the new Court. A circular colonnaded courtyard represents the crossing points of Auditorium, Sports Centre, route to College and route to the proposed hotel and to Cambridge and will, in effect; act as a secondary entrance to the College as a whole. 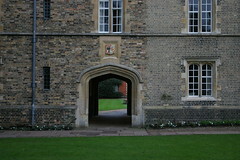 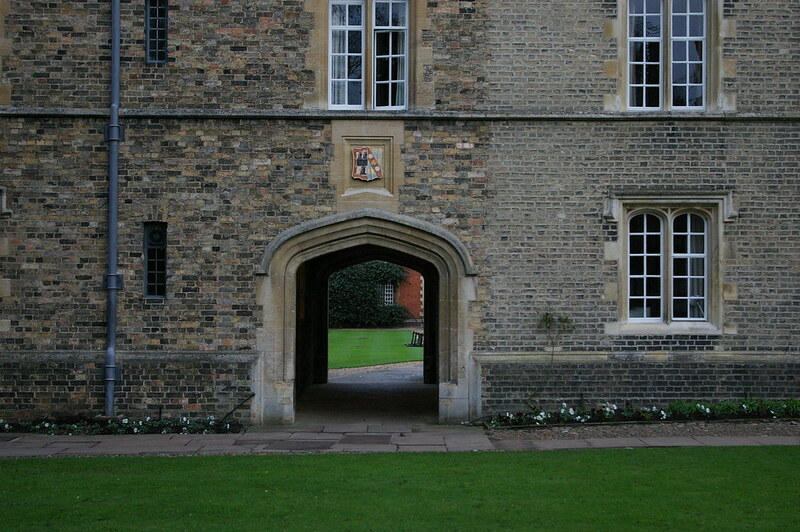 The route from the College to the circular court passes three practice rooms which have been extracted from the brief to form independent garden pavilions. 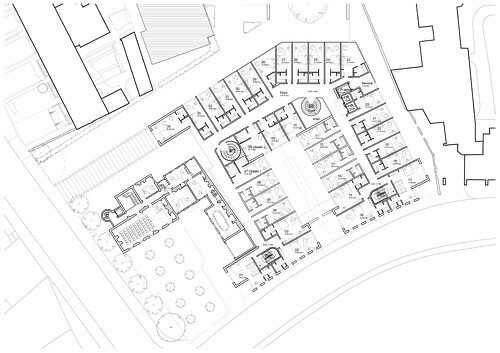 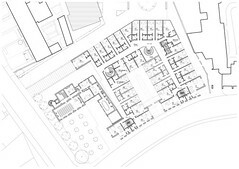 Our drawings show an 87-room hotel arranged around an entrance courtyard from Jesus Lane. This would involve demolishing the existing derelict buildings at this point. 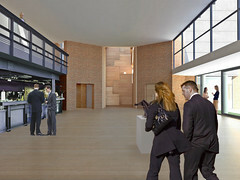 Bar and restaurant form the two long sides to the court at the ground floor on the journey to the main entrance, but a secondary entrance and vehicle drop off is placed at the rear and this entrance also links direct to the College when the new auditorium is used for Conference purposes. 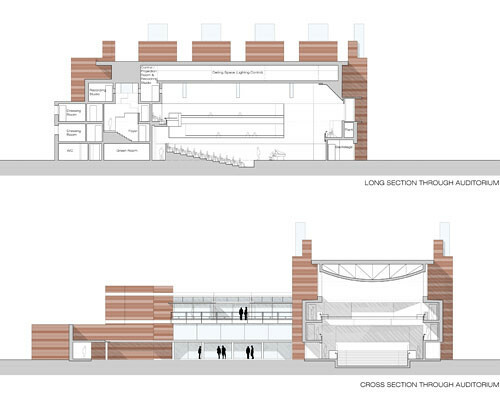 The sports centre is a simple box shielded from the College by the presence of the auditorium and foyer but linked to the foyer so that it can be used for theatrical performances.